War came to East Africa in June 1940 with little fanfare, neither the British in Kenya nor the Italians in Somaliland being particularly eager or prepared for a conflict. The British held Kenya with one three-battalion brigade of King’s African Rifles, locally-raised troops with British officers and senior NCO’s. A second brigade from Tanganyika and Nyasaland soon joined them. On the Italian side, Benito Mussolini’s impetuous 10 June 1940 declaration of war caught the colonial army still organizing itself. The Juba Sector, the Italian Somaliland border region facing Kenya, was to be held by a screen of irregulars known as “Bande” backed by two divisions of colonial regulars held in reserve plus additional coastal-defense troops around the ports of Mogadishu and Kismayu. The two Somali colonial divisions had but three brigades between them, with the fourth still forming. 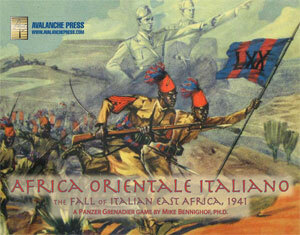 Across the former Ethiopian frontier with Kenya, the Italian Southern Sector was in the midst of forming four colonial infantry divisions, having stood up brigade headquarters before the war. Once again the border itself was screened by groups of Bande irregulars, and the supporting forces included a colonial cavalry brigade and a pair of Italian-manned armored car squadrons. While the Italian forces looked impressive on paper, most had been enrolled to keep them out of the growing rebellion against the colonial occupiers. After the fall of the Ethiopian Empire in 1936, Mussolini’s generals had well understood that disbanding the defeated armies and sending the troops home would be an act of utter, irredeemable stupidity. The new Italian soldiers had little loyalty to Mussolini or the tricolor, but neither did they rise against the new regime. Despite their disorganization, the Italians struck first, as a battalion from 25th Colonial Brigade (a Southern Sector outfit) assaulted the Kenyan frontier post at Moyale on 1 July. The garrison – one company of King’s African Rifles – beat off the assault, and the commander in Kenya, D.P. Dickinson, dispatched reinforcements. The Italians returned with the full brigade on the 10th and ejected the KAR, marking Italy’s first successful conquest of enemy territory. Meanwhile Italian irregulars took the border fort at El Wak without opposition, while the colonials from Moyale fought off the 6th King’s African Rifles and 1st Battalion, Nigerian Regiment in a sharp action and probed forward to the water holes at Ajau and Batolo. That gave the Italians possession of the salient of Kenyan territory wedged between Ethiopia and Italian Somaliland before the heavy seasonal rains brought an end to active operations for the next several months. Gold Coast troops arrive in Kenya. 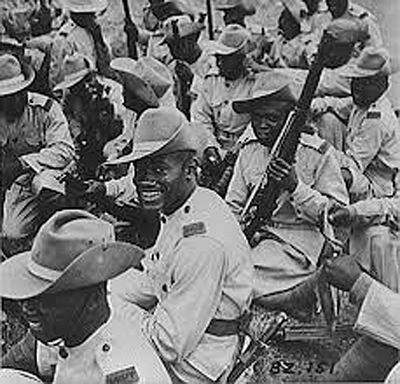 The British used the pause to bring up huge numbers of reinforcements from Nigeria, the Gold Coast and South Africa as well as raising additional East African forces. The new commander in Kenya, Alan Cunningham, now disposed of three infantry divisions - 1st South African and 11th and 12th African, each of three brigades – and probed at the Italian frontier forces starting in late November 1940, once the ground had dried from the heavy seasonal rains. The Italians also moved reinforcements into place, sending the motorized 15th Amhara Colonial Brigade, the centerpiece of the colonial empire’s strategic reserve, to Mogadishu. It ultimately took no part in the fighting and withdrew to the north before the British assault began. After losing the frontier post at El Wak to an overwhelming assault by South African and African brigades, the Italian commander in East Africa, the Duke of Aosta, fired the sector commander and replaced him with Carlo de Simone, an experienced veteran of the Ethiopian War who had been successful in the Italian conquest of British Somaliland. Cunningham planned a drive up the Somali coast, with the ports of Kismayu and Mogadishu as the objectives. His staff assumed that the Italians would stand behind the Juba River, forcing the British to supply their attacking force across the desolate near-desert of Jubaland, roughly 150 miles. Cunningham decided that he could only supply four of his brigades, but did manage to collect enough trucks, mostly South Africa vehicles driven all the way from the Union to Kenya, to fully motorize his 23rd Nigerian Brigade as well as all of his artillery and support services. A motley collection of aircraft, including armed trainers, gave the British air superiority and the Royal Navy provided a task force of six ships: the light carrier Hermes, heavy cruisers Shropshire and Hawkins, light cruisers Capetown and Ceres and destroyer Kandahar. The troops set out on 24 January. The first contact with the enemy came at the village of Afmadu about 30 miles west of the Juba, where 22nd East African Brigade brushed aside light resistance. 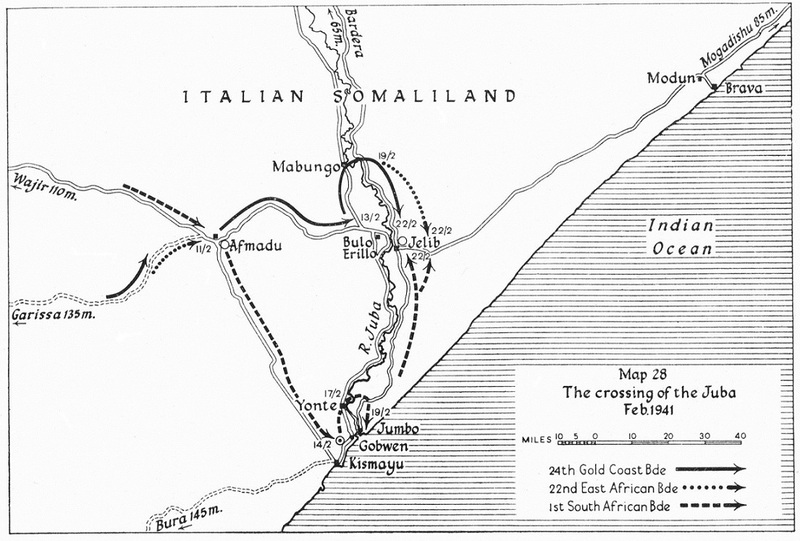 Two days later the British reached the Juba line and heavy fighting broke out around the airfield at Bulo Erillo; after taking heavy casualties 24th Gold Coast Brigade succeeded in driving off the defenders from 102nd Somali Division. South African troops celebrate the re-capture of Moyale. Twelfth African Division’s commander, Alfred Godwin-Austen, had commanded the garrison of British Somaliland against the Italian invasion, and withdrawn in the face of superior strength. Winston Churchill raged that Godwin-Austen’s troops had not suffered enough casualties and demanded a court-martial for the general, with the implication of cowardice. Sir Archibald Wavell, commander of British forces in the Middle East, staunchly defended Godwin-Austen and showed his confidence by immediately putting him back into combat. Godwin-Austen rewarded that move by leading his division very aggressively on the drive to the Somali ports. He ordered 1st South African Brigade to make a dawn crossing of the lower Juba, but Brigadier Dan Pienaar delayed (possibly due to intoxication) and the South Africans failed to stop the Kismayu garrison from slipping across the river. With Pienaar’s men stumbling about the bush, Godwin-Austen detailed 22nd East African Brigade to secure Kismayu on the 14th. Finally the South Africans crossed the Juba on the 17th, and fought off a determined counter-attack from 102nd Somali Division on the following morning. By the 19th the British had completed a pontoon bridge over the Juba and the South Africans cleared the left (eastern) bank of the Juba down to the coast. On the 22nd Godwin-Austen’s three brigades launched a concentric attack on 102nd Somali Division’s home station at Jelib just east of the Juba, forcing the Italians into headlong retreat. On the same day the 23rd Nigerian Brigade crossed the Juba to the north at Mabungo, where it fought off a counter-attack by 101st Somali Division. With 102nd Somali Division battered and in need of reorganization, the Duke of Aosta ordered De Simone to pull it back across the Ogaden Desert to Jijiga in Ethiopia. Meanwhile the 101st Somali Division’s single brigade was to withdraw up the Juba into Ethiopia as well where it would come under the Southern Sector’s command. Cunningham ordered the motorized Nigerians forward at full speed, and they swiftly moved along the (relatively) excellent Italian road system to take Mogadishu on the 25th, having advanced 235 miles in three days. The South Africans fell back into reserve amid the first whispers of command-level incompetence that would only grow louder in the Western Desert, while Godwin-Austen’s African brigades marched forward in the wake of the Nigerians. The British had conquered Italian Somaliland at the cost of relatively few casualties, while claiming to have inflicted 30,000 killed, wounded or captured on the Italians (about half again the total strength of De Simone’s forces). The long-service professionals of the King’s African Rifles and West African Frontier Force (the formal name of the battalions from Nigeria and Gold Coast) had performed well; the South Africans, not so much. On the Italian side, the defenders had been hampered by a total lack of air support and weak artillery (almost exclusively provided by lightweight camel-drawn 65mm mountain guns and a pair of motorized 77mm batteries; most Italian artillery in Jubaland consisted of outdated pieces in fixed positions). The Somalis had fought hard as was their wont – though the men had no loyalty to Mussolini’s regime, Somali culture then as now held the act of combat in high regard, win or lose.